Jaguar Colorado Springs has a couple of Approved Certified PreOwned Jaguar vehicles available in our pre-owned inventory! 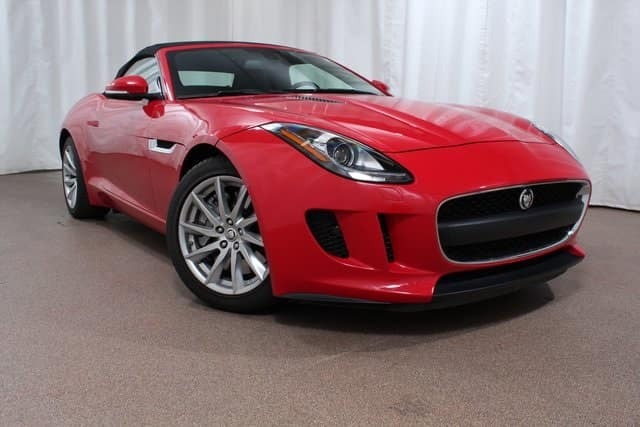 That includes this beautiful 2014 Jaguar F-TYPE convertible that has just under 7,000 miles on it. We keep it in pristine condition in a climate-controlled environment so it is in amazing condition for you to purchase. Equipped with a 3.0L V6 supercharged engine, you should expect an estimated 20 MPG city/28 MPG highway! Plus, you can enjoy an exciting variety of features including navigation system, SiriusXM Satellite Radio, steering wheel mounted audio controls, rain sensing windshield wipers, Meridian 380W Audio System w/10 Speakers, and remote keyless entry. As an Approved Certified PreOwned Jaguar, you get added benefits like a 7-yr/100,000-mile limited warranty, 165-point inspection, 24-hour roadside assistance, a vehicle history report, and more. So, stop into Jaguar Colorado Springs today to check out our current Approved Certified Pre-Owned vehicles and even take a test drive!